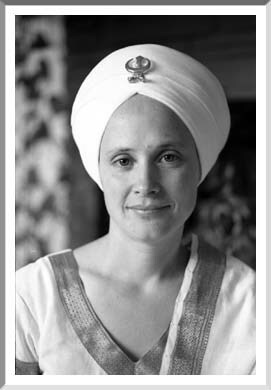 As part of a Sikh household in Colorado and California, Snatam Kaur Khalsa grew up with Kundalini Yoga, meditation, and Kirtan chants. "Both of my parents were musicians," says Snatam, who studied voice, violin and percussion. "The Sikh path celebrates music." After high school, Snatam worked at a boarding school in in India, taking care of children and playing music for their chants. She graduated from Mills College with a biochemistry degree, then began work in research and development at Peace Cereals, a Golden Temple brand made in Eugene. "I developed a number of cereal flavors," says Snatam, who also returned to India to study with Kirtan master Bhai Hari Singh. Her first CD, To Heaven and Beyond, was released by Spirit Voyage Music in 2000. Her fourth album, Grace, appeared in late 2004. In a concert marking the start of her international Celebrate Peace Tour, Snatam will perform on harmonium and vocals, along with collaborators Thomas Barquee and GuruGanesh Singh, at Eugene's First Christian Church on the 29th of January (details at snatamkaur.com). Between tour dates, she will continue to teach Kundalini and Naad Yoga at Yoga West.